Double textured with the chopped hard boiled eggs and scrambled eggs, fragrant with fresh parsley and tangy hints of sun dried cheri tomatoes. Wait, there is one more exotic flavor into this scramble.That is a smoked cheese, a crumbly dry smoked cheese that Charis had brought to me from Calcutta. 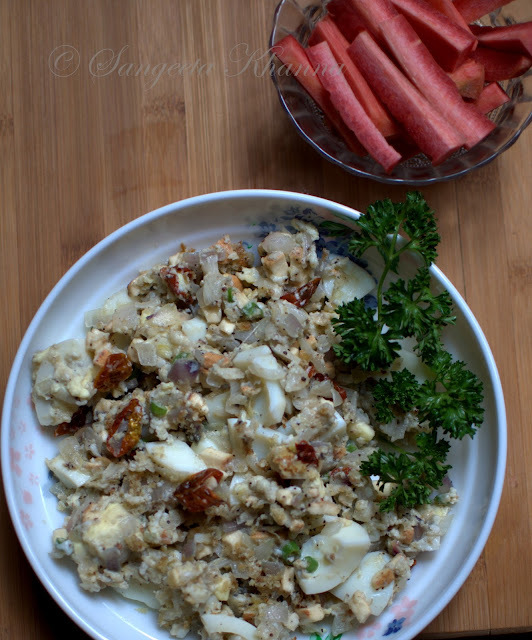 It is such a yummy cheese to have in my egg scrambles and even parathas. For the two of us, I used 2 hard boiled eggs and 2 raw eggs, half cup of finely chopped onions, handful of sun dried cheri tomatoes, hint of chopped green chilies, and some finely chopped parsley. Salt and pepper to taste and the cooking fat is Olive oil. Two tbsp of finely chopped smoked cheese was used. The trick is to stir fry the green chilies. parsley stems and onions first, mix the chopped smoked cheese and sun dried tomatoes to the broken eggs in a bowl, cube the boiled eggs and dunk them too into the raw egg mixture. Season with salt and pepper and gently pour into the frying onion mixture. Lightly turn and flip a few times and you get a beautifully textured egg scramble. Have it for breakfast or for a meal with some carrot sticks on the side. It will keep you full till you forget when you had your last meal. The taste is ruled by the yummy ingredients used. Good ingredients never lie, they nourish you, the body and soul both. 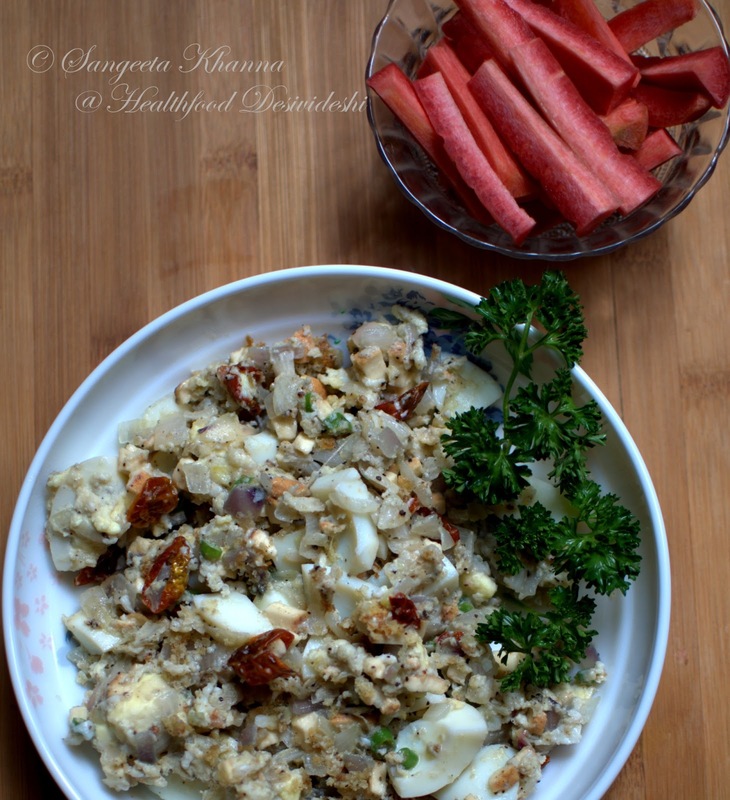 This is coincidence sangeetha i just posted boiled egg burji on my food blog. A bowl of this will be a good and heavy breakfast no? Cheese and eggs are good combo. Wow! The eggs are really rocking in this dish. i love the texturing idea. will definitely try this at home with other ingredients i have in hand. This I am going to try !